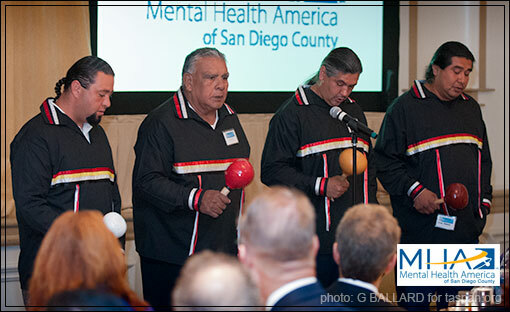 SAN DIEGO, Oct. 4, 2012 — The Mental Health America of San Diego County held their Healthy Minds Luncheon at the US Grant in downtown San Diego. 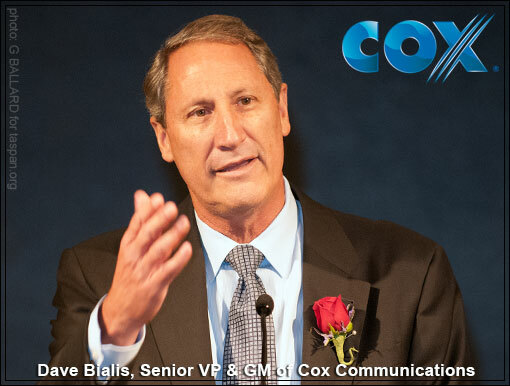 Dave Bialis, Senior Vice President and General Manager of Cox Communications California, was presented the prestigious Leadership in Action Award by Dan McAllister, MHA Chairman of Board, just after addressing the group (above). 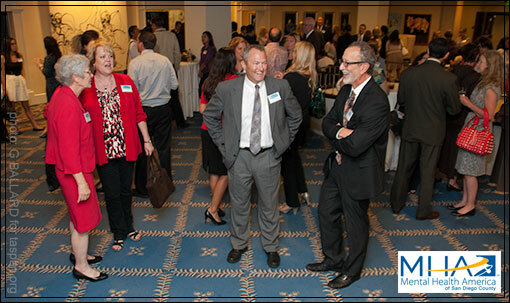 Attendees mingled during the Registration and Networking period just minutes before the luncheon. 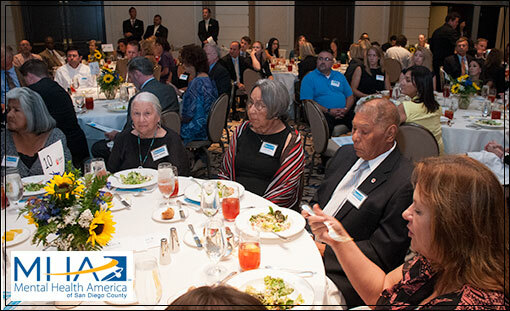 Member, Board of Directors, Mental Health America of San Diego, Shirley Murphy (Lakota), posed for a candid photo with two attendees from the Psychiatric Centers at San Diego, Cassie Wilsie (left) and Anna Gaipa (right). 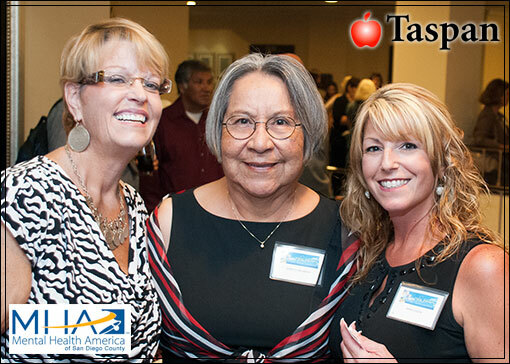 Shirley Murphy (center) is President of Taspan Consulting Company in El Cajon, California. 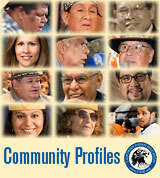 MHA of San Diego County Board Member Andrew Poat was an Event Leader and introduced the American Indian Kumeyaay and Quechan bird singers. 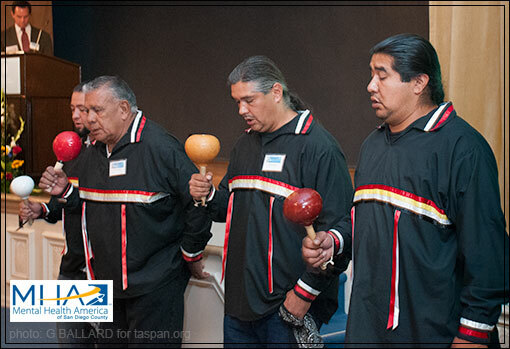 Kumeyaay bird song leader Chairman Leroy Elliott, Manzanita Indian Reservation, (second from left) sang several Southern California Indian bird songs alongside the three other tribal singers: (l-r) Mike Worrell (Kumeyaay), Jamie LaBrake (Kumeyaay), and Ernesto Morales (Kumeyaay-Quechan). 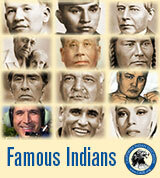 The Presidential Ballroom in the U.S. Grant hotel was filled to near capacity. The famous luxury hotel is located in the heart of downtown San Diego at Fourth and Broadway near the historic Gaslamp Quarter. 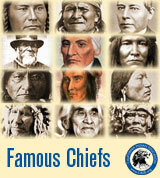 The Southern California tribal singers wore matching traditional ribbon shirts, black with white, yellow and red ribbons. 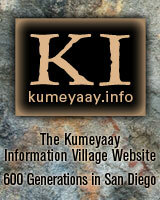 Professional catering services US Grant, San Diego luxury hotel. 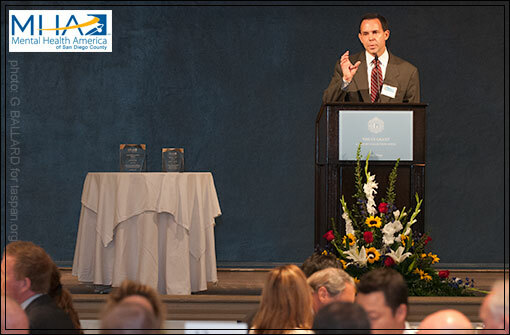 Andrew Poat introduced MHA (San Diego) chairman of the board Dan McAllister who in turn spoke to the crowd and presented the awards. 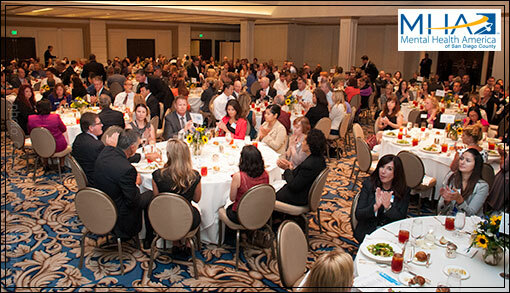 Chairman of the board Dan McAllister, MHA of San Diego County, presented the awards. 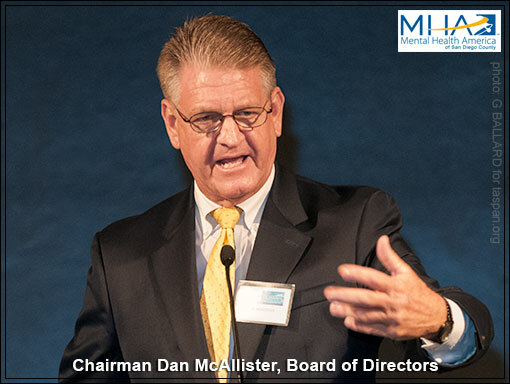 Mr. McAllister was elected the San Diego County Treasurer-Tax Collector in November 2002 and reelected to his third term in June 2010 by an overwhelming 78% majority of the vote. Not only is he responsible for the collection of more than $4.6 billion in property taxes each year, but his office also manages the investment of approximately $7 billion in the County’s Investment Pool, ensuring that these funds are wisely invested and safeguarded for entities such as the school districts and cities in the County. 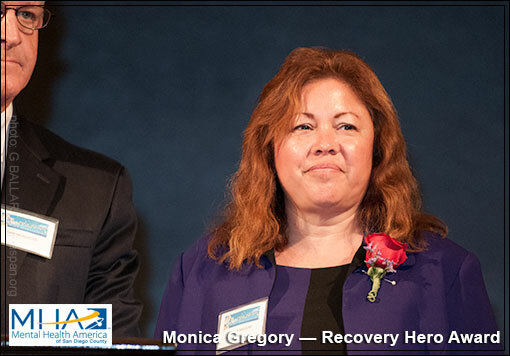 Chairman McAllister presented Monica Gregory with the Recovery Hero Award "For demonstrating outstanding recovery through her participation in the MHA/Visions activities and growing from homelessness to living a self-directed life." 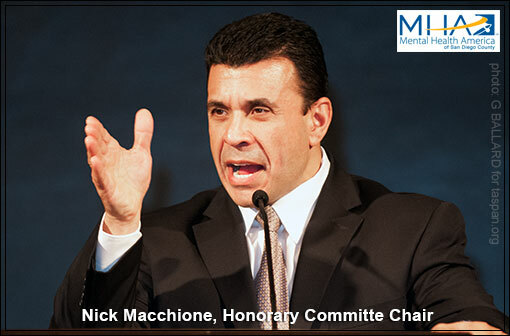 Honorary Committee Chair Nick Macchione took the lectern and addressed the audience. Mr. Macchione introduced Dave Bialis. 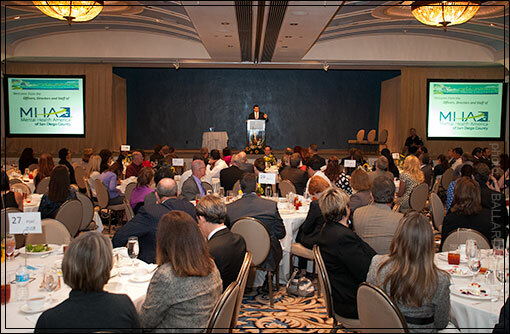 Mr. Macchione currently serves as the Director of the County of San Diego Health and Human Services Agency, overseeing an agency with an annual budget of more than $1.4 billion, and a workforce of more than 5,000 employees. 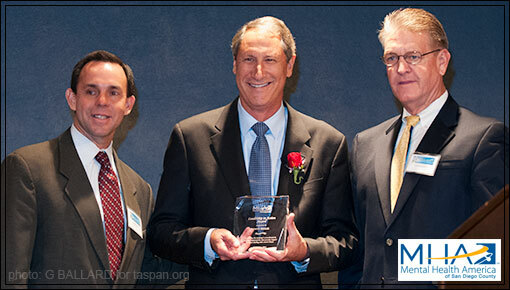 Dave Bialis, Senior Vice President and General Manager of Cox Communications (center), received the Leadership in Action Award for "Leading the company's commitment to assisting organizations that provide support for those dealing with mental illness." The two MHA awards pictured. 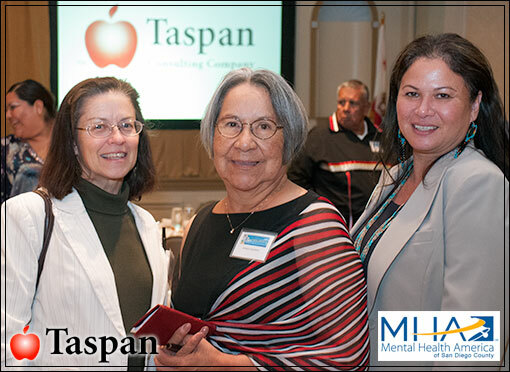 Member, Board of Directors, MHA San Diego, Shirley Murphy posed for a snapshot at the end of the event with Stephanie Connolly (left), and Racquel Morrison (Iroquois). 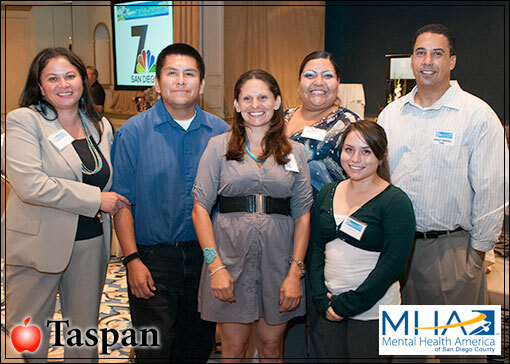 San Diego County MHA and Indian Human Resource Center staff members posed for a photo at the end of the San Diego corporate event. 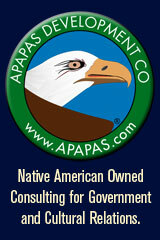 Photos courtesy of Shirley Murphy, Taspan Consulting Company. 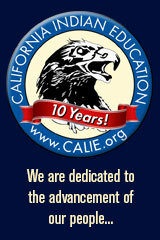 California Indian Education website produced by Ernie Salgado Jr., Soboba tribal member. 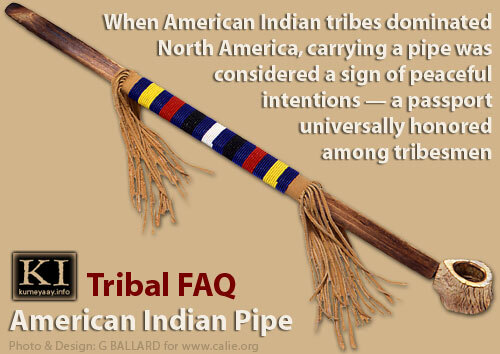 Photos, presentation by Gary Ballard in San Diego, USA.